When you have a decent work experience and have what to share in your resume, you’ll really benefit. Yet still, if you are a student graduate, it means that your resume will be almost empty. Resume writing for college graduates has specific peculiarities. It goes to show that college resumes differ from resumes of experienced workers. Spending several hours browsing the web, you’ll definitely find good resumes examples. Nevertheless, it is really difficult! Various resume portals publish too many college resume templates. For inexperienced students, it will be difficult to focus on this information. Furthermore, it will be difficult to find out which information is really worthy. Analyzing various samples, we see that resume objectives differ. A Professional Looking Email Address Must be Used. In some instances, a student creates a funny email address at the beginning of his education and uses it for a long time. Yet still, an email address, which sounds like [email protected] is funny and attractive only when you are a student. When you have finally started your journey which sounds like "seek employment", you need to be more serious. Your overarching target is to create a professionally looking email address which will be used by you later. In doing so, you’ll do a favor for yourself. Furthermore, if you try to get a job at a popular and huge corporation, you should definitely be serious! Add a Link to Your LinkedIn profile. To have an account on LinkedIn is a great idea because this portal is a perfect place to create your professional brand and maybe even make some connections. Besides, LinkedIn is a great place to find your future employers. Statistically, this portal is regarded to be a number one place to search for and evaluate new candidates. Job recruiters aren’t obliged to spend too much time searching for the information about you. So, simplify this task and add a link to your profile on LinkedIn (locate it at the top of a resume). Don’t overload your resume with pure fluff. Analyzing all great resume examples (we mean college resumes), we must confess that they don’t comprise too many buzzwords. This is a very good advice because you are a college graduate. So, it means that your work experience is poor. For that reason, there is no need to add too many buzzwords that describe your personality. Instead of this, it will be more effectively if you describe your experience at college. For instance, describe how you worked on a group project and were awarded for this work. Optimize a Resume with Relevant Keywords. Worthy companies have various gatekeepers, software products that analyze all resumes. For that reason, you need to optimize your resume with appropriate keywords (if you want your resume to be viewed by a hiring manager). To do this correctly, you need to look through all job listings that are interesting for you, find out the key word and add them to your resume. Of course, you shouldn’t add all possible keywords. Add only those ones that are exposed to the chosen industry and characterize you. You can add them in two ways: either in a core competence section or in the work experience section. Highlight Only the Experience which You’ve Got at College. Mostly, the information about your school isn’t in great request. Hiring managers are more interested in the information about your academic experience. For that reason, you need to concentrate on highlighting your experience, activities and accomplishments, you’ve got at college. If there is anything that supports your future job positions, add this information to your resume. Don’t add the information about your course work. As a rule, writing a college student resume, you shouldn’t think that this resume should be packed with everything. Definitely, employers will appreciate your internship experience. Nevertheless, if all courses you took have nothing to do with your future job position, don’t add all of them. In this case, your primary target is to show the hiring manager that you learned the subjects that are tied to the job positions. It means that you need to draw the attention to your winning features. In other words, if you can make boast of great internship experience, always highlight this information. And vise verse, if you haven’t the experience of work with the jobs that are related to the chosen position, instead of this you should add other information. It can be various academic honors or high-level courses. It means that you need to provide an employer with the information about your previous work environment. You need to describe every company with which you held an internship. Of course, this information should be added only in case it is related to your future career goals. Analyzing the existing resume summary examples that were composed by students, we must confess that students frequently add the information about their internship, especially if it is the experience of work at well-known companies. Bullet the Most Significant Information. It will be great if you use bullet points with the aim to draw attention to the most important information. Because of the fact that you are a college graduate, you can’t make boast of good work experience. For that reason, you need to include the information about your accomplishments and some other contribution that you made. Writing about your bullets, don’t forget about using the action verbs. This advice is useful in the situation when you are new to the workforce. For that reason, you can’t make boast of major accomplishments. Nevertheless, you should use action verbs with the aim to describe your activities. Highlight the Information about Your Extracurricular Activities. This is your first college resume. On that score, its primary purpose is to play up your best selling points. Probably, you have the experience of being engaged in various extracurricular activities or you obtained scholarships or some other honors. So, if you have this experience, highlight it in your resume. 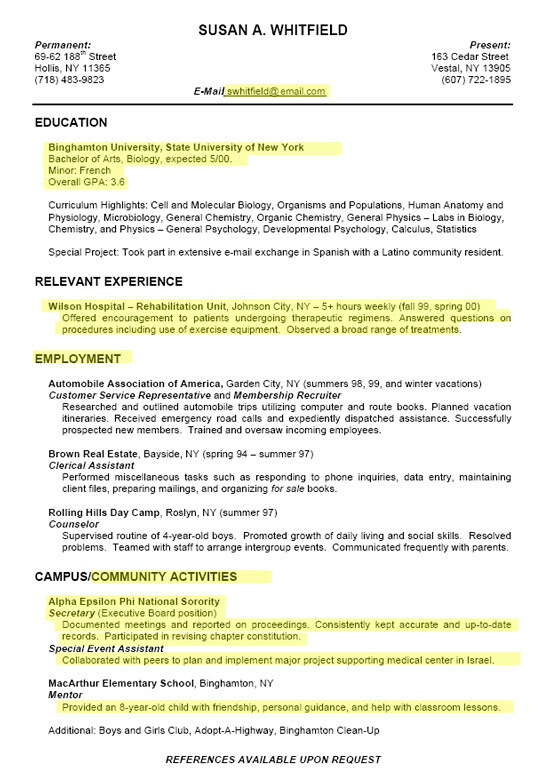 The above-written example of a college resume is an ideal one. So, you can follow our recommendations creating your own. Nevertheless, remember one simple truth – if you are a college graduate, everyone understands that your working experience is poor. So, there is no need to fill it with extra information or fool an employer. Always be yourself and write only truthful information. 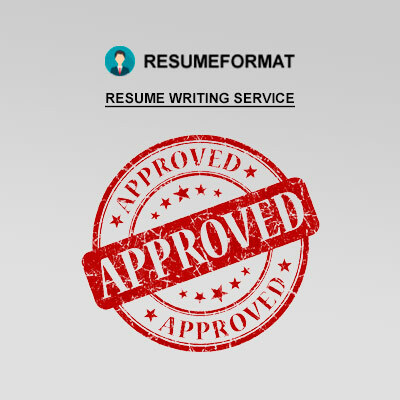 In case you have no idea how to start, or create it in the best possible way, welcome to the experienced team of ResumeFormat2015. Our writers will help you create a worthy resume which will help you obtain the first job in your life.